In the GB/s regime, accurate modeling of conductor losses is a precursor to successful high-speed serial link designs. Failure to model roughness effects can ruin you day. For example, Figure 1 shows the simulated total loss of a 40 inch printed circuit board (PCB) trace without roughness compared to measured data. Total loss is the sum of dielectric and conductor losses. With just -3dB delta in insertion loss between simulated and measured data at 12.5 GHz, there is half the eye height opening with rough copper at 25GB/s. 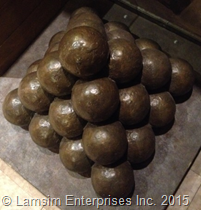 So what do cannon balls have to do with modeling copper roughness anyway? Well, other than sharing the principle of close packing of equal spheres, and having a cool name, not very much. According to Wikipedia, close-packing of equal spheres is defined as “a dense arrangement of congruent spheres in an infinite, regular arrangement (or lattice)” . The cubic close-packed and hexagonal close-packed are examples of two regular lattices. The cannonball stack is an example of a cubic close-packing of equal spheres, and is the basis of modeling the surface roughness of a conductor in this design note. Figure 1 Comparisons of measured insertion loss of a 40 inch trace vs simulation. Eye diagrams show that with -3dB delta in insertion loss at 12.5GHz there is half the eye opening at 25GB/s. Modeled and simulated with Keysight EEsof EDA ADS software . In printed circuit (PCB) construction there is no such thing as a perfectly smooth conductor surface. There is always some degree of roughness that promotes adhesion to the dielectric material. Unfortunately this roughness also contributes to additional conductor loss. Electro-deposited (ED) copper is widely used in the PCB industry. A finished sheet of ED copper foil has a matte side and drum side. The drum side is always smoother than the matte side. The matte side is usually attached to the core laminate. For high frequency boards, sometimes the drum side of the foil is laminated to the core. In this case it is referred to as reversed treated (RT) foil. Some other common names referring to ULP class are HVLP or eVLP. Profilometers are often used to quantify the roughness tooth profile of electro-deposited copper. Tooth profiles are typically reported in terms of 10-point mean roughness (Rz ) for both sides, but sometimes the drum side reports average roughness (Ra ) in manufacturers’ data sheets. Some manufacturers also report RMS roughness (Rq ). δ = skin depth in meters. Alternating current (AC) causes conductor loss to increase in proportion to the square root of frequency. This is due to the redistribution of current towards the outer edges caused by skin-effect. 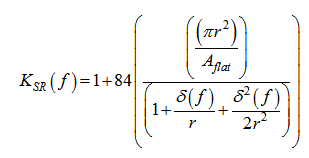 The resulting skin-depth (δ ) is the effective thickness where the current flows around the perimeter and is a function of frequency. σ = conductivity in S/m. For annealed copper σ = 5.80E7 S/m. The model has correlated well for microstrip geometries up to about 15 GHz, for surface roughness of less than 2 RMS. However, it proved less accurate for frequencies above about 5GHz for very rough copper  . In recent years, the Huray model  has gained popularity due to the continually increasing data rate’s need for better modeling accuracy. It takes a real world physics approach to explain losses due to surface roughness. 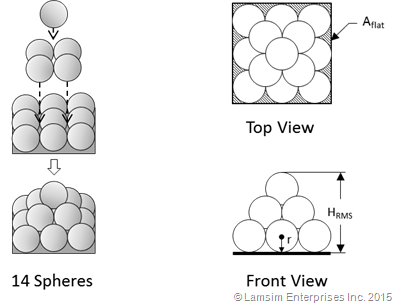 The model is based on a non-uniform distribution of spherical shapes resembling “snowballs” and stacked together forming a pyramidal geometry, as shown by the scanning electron microscope (SEM) photo in Figure 2. 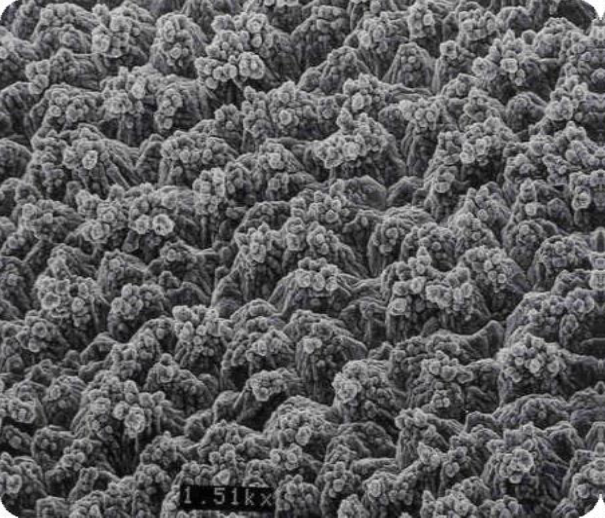 Figure 2 SEM photograph of electrodeposited copper nodules on a matte surface resembling “snowballs” on top of heat treated base foil. Photo credit Oak-Mitsui. δ (f ) = skin-depth, as a function of frequency, in meters. Using the concept of cubic close-packing of equal spheres, the radius of the spheres (ai ) and tile area (Aflat ) parameters for the Huray model can now be determined solely by the roughness parameters published in manufacturers’ data sheets. Why is this important? Well, as my friend Eric Bogatin often says, “Sometimes an OK answer NOW! is more important than a good answer late”. For example, often during the architectural phase of a backplane design, you are going through some what-if scenarios to decide on a final physical configuration. Having a method to accurately predict loss from data sheets alone rather than go through a design feedback method, described in  can save an enormous amount of time and money. Another reason is that it gives you a sense of intuition on what to expect with measurements to help determine root cause of differences; or sanitize simulation results from commercial modeling tools. If you are like me, I always like to have alternate ways to verify that I have used the tool properly. Recalling that losses are proportional to the surface area of the roughness profile, the Cannonball model can be used to optimally represent the surface roughness. As illustrated in Figure 3, there are three rows of spheres stacked on a square tile base. Nine spheres are on the first row, four spheres in the middle row, and one sphere on top. Figure 3 Cannonball model showing a stack of 14 uniform size spheres (left). Top and front views (right) shows the area (Aflat) of base, height (HRMS) and radius of sphere (r). Aflat = area of square tile base surrounding the 9 base spheres in sq. meters. Where: Rz_drum is the 10-point mean roughness in meters. If the data sheet reports average roughness, then Ra_drum is used instead. Where: Rz_matte is the 10-point mean roughness in meters. To test the accuracy of the model, board parameters from a PCBDesign007 February 2014 article, by Yuriy Shlepnev  was used. Measured data was obtained from Simbeor software design examples courtesy of Simberian Inc. . The extracted de-embedded generalized modal S-parameter (GMS) data was computed from 2 inch and 8 inch single-ended stripline traces. They were originally measured from the CMP-28 40 GHz High-Speed Channel Modeling Platform from Wild River Technology . 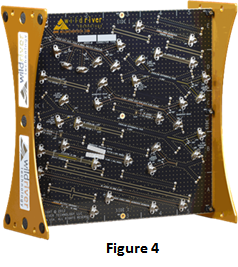 The CMP-28 Channel Modeling Platform, (Figure 4 left -credit Wild River Technology) is a powerful tool for development of high-speed systems up to 40 GHz, and is an excellent platform for model development and analysis. It contains a total of 27 microstrip and stripline interconnect structures. All are equipped with 2.92mm connectors to facilitate accurate measurements with a vector network analyzer (VNA). The PCB was fabricated with Isola FR408HR material and reverse treated (RT) 1oz. foil. The dielectric constant (Dk) and dissipation factor (Df), at 10GHz for FR408HR 3313 material, was obtained from Isola’s isoStack® web-based online design tool . This tool is a free, but you need to register to use it. An example is shown in Figure 5. Typical traces usually have a trapezoidal cross-section after etching due to etch factor. Since the tool does not handle trapezoidal cross-sections in the impedance calculation, an equivalent rectangular trace width was determined based on a 2:1 etch-factor (60 deg taper). The as designed nominal trace width of 11 mils, and a 1oz trace thickness of 1.25 mils per isoStack® was used in the analysis. Figure 5 Example of Isola’s isoStack® online software used to determine dielectric thicknesses, Dk, Df and characteristic impedance for the CMP-28 board. The default foil used on FR408HR core laminates is MLS, Grade 3, controlled elongation RT foil. The roughness parameters were easily obtained from Oak-mitsui . Reviewing the data sheet, 1 oz. copper roughness parameters Rz for drum and matte sides are 120μin (3.175 μm) and 225μin (5.715μm) respectively. Because this is RT foil, the drum side is the treated side and bonded to the core laminate. An oxide or micro-etch treatment is usually applied to the copper surfaces prior to final lamination. This provides enhanced adhesion to the prepreg material. CO-BRA BOND®  or MultiBond MP  are two examples of oxide alternative micro-etch treatments commonly used in the industry. Typically 50 μin (1.27μm) of copper is removed when the treatment is completed. But depending on the board shop’s process control, this can be 70-100 μin (1.78-2.54μm) or higher. The etch treatment creates a surface full of micro-voids which follows the underlying rough profile and allows the resin to squish in and fill the voids providing a good anchor. Because some of the copper is removed during the micro-etch treatment, we need to reduce the published roughness parameter of the matte side by nominal 50 μin (1.27 μm) for a new thickness of 175μin (4.443μm). Figure 6 shows SEM photos of typical surfaces for MLS RT foil courtesy of Oak-mitsui. The left and center photos are the treated drum side and untreated matte side respectively. The right photo is a 5000x SEM photo of the matte side showing micro-voids after etch treatment. Figure 6 Example SEM photos of MLS RT foil courtesy of Oak-mitsui. Left is the treated drum side and center is untreated matte side. SEM photo on the right is the matte side after etch treatment. The data sheet and design parameters are summarized in Table 1. Respective Dk, Df, core, prepreg and trace thickness were obtained from the isoStack® software, shown in Figure 5. Roughness parameters were obtained from Oak-mitsui data sheet. Rz of the matte side after micro-etch treatment (Rz = 4.443μm) was used to determine KSR_matte . Table 1 CMP-28 test board parameters obtained from manufacturers’ data sheets and design objective. Keysight EEsof EDA ADS software  was used for modeling and simulation analysis. A new controlled impedance line (CIL) designer enhancement, in version 2015.01, makes modeling the transmission line substrate easy. Unlike earlier substrate models, the CIL model allows you to model trapezoidal traces. Figure 7 is the general schematic used for analysis. There are three transmission line substrates; one for dielectric loss; one for conductor loss and the other for total loss without roughness. Figure 7 Keysight EEsof EDA ADS generic schematic of controlled impedance line designer used in the modeling and simulation analysis. Dielectric loss was modeled using the Svensson/Djordjevic wideband Debye model to ensure causality. By setting the conductivity parameter to a value much-much greater than the normal conductivity of copper ensures the conductor is lossless for the simulation. Similarly the conductor loss model sets the Df to zero to ensure lossless dielectric. Total insertion loss (IL) of the PCB trace, as a function of frequency, is the sum of dielectric and rough conductor insertion losses. To accurately model the effect of roughness, the respective roughness correction factor (KSR ) must be multiplicatively applied to the AC resistance of the drum and matte sides of the traces separately. Unfortunately ADS, and many other commercial simulators, do not allow access to these surfaces to apply the correction properly. The best you can do is to apply the average of (KSR_drum ) and (KSR_matte ) side to the smooth conductor loss (ILsmooth ), as described above. 1. 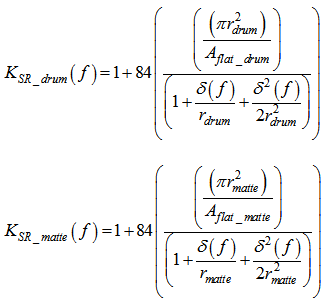 Determine HRMS_drum and HRMS_matte from Equation 6 and Equation 7. 6. Apply Equation 8 to determine total insertion loss of the PCB trace. The results are plotted in Figure 8. The left plot compares the simulated vs measured insertion loss for data sheet values and design parameters. Also plotted is the total smooth insertion loss (crosses) which is the sum of conductor loss (circles) and dielectric loss (squares). Remarkably there is excellent agreement up to about 30GHz by just using algebraic equations and published data sheet values for Dk, Df and roughness. The plot shown on the right is the simulated (blue) vs measured (red) effective dielectric constant (Dkeff ), and is determined by the equations shown. As can be seen, the measured curve has a slightly higher Dkeff (3.76 vs 3.63 @ 10GHz) than published. According to , the small increase in the Dk is due to the anisotropy of the material. When the measured Dkeff (3.76) was used in the model, for core and prepreg, the IL results shown in Figure 9 (left) are even more remarkable up to 50 GHz! Figure 8 IL (left) for a 6 inch trace in FR408HR RTF using supplier data sheet values for Dk, Df and Rz. Effective Dk is shown right. Figure 9 IL (left) for a 6 inch trace in FR408HR RTF and effective Dk (right). Figure 10 compares the Cannonball model against the H&J model. The results show that the H&J is only accurate up to approximately 15 GHz compared to the Cannonball model’s accuracy to 50GHz. Figure 10 Cannonball Model (left) vs Hammerstad-Jensen model (right). Using the concept of cubic close-packing of equal spheres to model copper roughness, a practical method to accurately calculate sphere size and tile area was devised for use in the Huray model. By using published roughness parameters and dielectric properties from manufacturers’ data sheets, it has been demonstrated that the need for further SEM analysis or experimental curve fitting, may no longer be required for preliminary design and analysis. When measurements from CMP-28 modeling platform, fabricated with FR408HR and RT foil, was compared to this method, there was excellent correlation up to 50GHz compared to the H&J model accuracy to 15GHz. The Cannonball model looks promising for a practical alternative to building a test board and extracting fitting parameters from measured results to predict insertion loss due to surface roughness. If you liked this design note and want to learn more, or get more details on this innovative roughness modeling methodology, you can visit my web site, LAMSIM Enterprises.com , and download a copy of the white paper , or my award winning DesignCon 2015 paper, . And while you are there, feel free to investigate my other white papers and publications. E. Bogatin, D. DeGroot , P. G. Huray, Y. Shlepnev , “Which one is better? Comparing Options to Describe Frequency Dependent Losses”, DesignCon2013 Proceedings, Santa Clara, CA, 2013.